Business Server (SBS) 2008 & 2011 Standard Edition in a virtual machine (VM)). For our small business customers tight on funds and with relatively light server needs, we feel a server using SATA drives is a cost effective solution. Considering the cost of 500GB and 1TB drives, ordering 3 drives for a RAID1 + HotSpare configuration is quite economical with reasonably decent performance. The motherboard we choose was the SuperMicro X8SIL-F which utilizes the Intel 3420 chipset with built-in RAID support. Most of our customers are a good fit for the Microsoft Windows Small Business Server (SBS) 2008/2011 Standard Edition Operating System. We decided the many benefits of running SBS in a virtual machine warranted testing a SBS install in a (free) Hyper-V Server 2008 R2 Virtual Machine (VM). <BeginRant> It is very frustrating that Microsoft won't allow a free host install of Server 2008 R2 (with just Hyper-V Role) with the SBS 2008/2011 Standard OS! Being able to manage a host server from the GUI would make so much more sense for the small business!<EndRant> But I am certainly not the first to lament this issue. 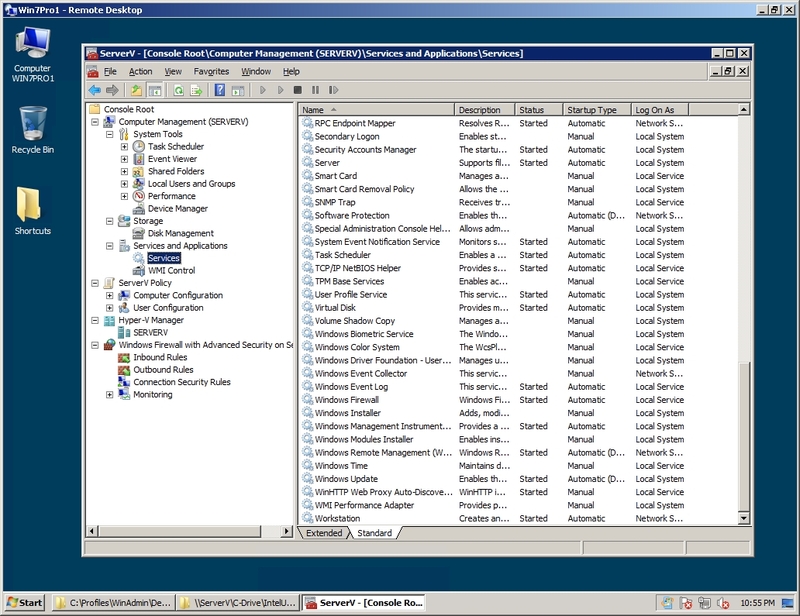 With the free Hyper-V Server 2008 R2 SP1, Microsoft has included a very nice menu driven sconfig.cmd utility. 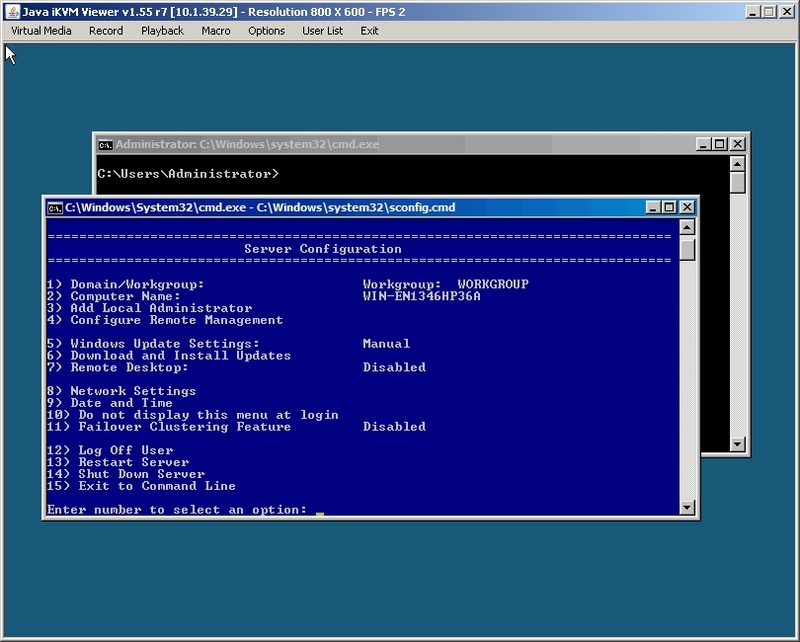 Configuration of the Hyper-V Server was a snap! I was truly impressed! 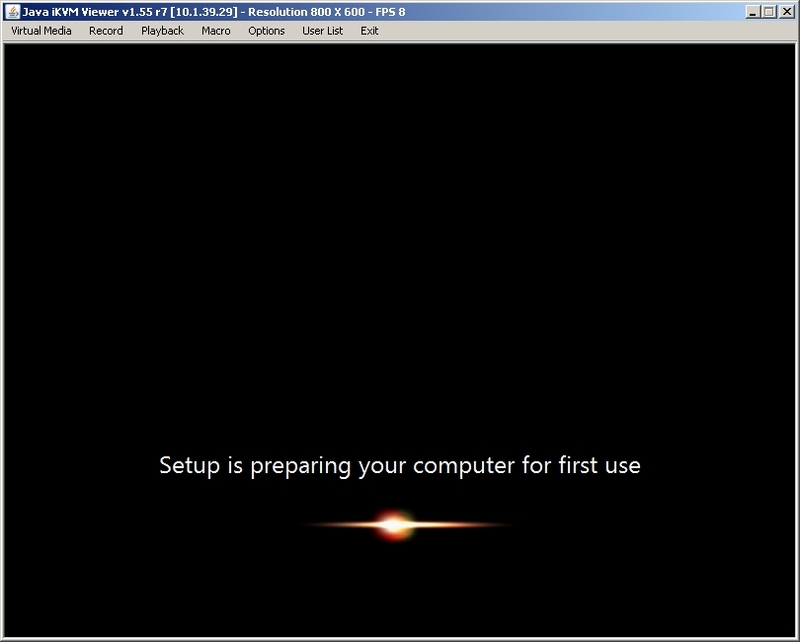 Complete install and setup of the server, from first power-on to configuring a Virtual Machine took less than an hour. Judging from all the posts out there, I think I am fortunate my first foray into free Hyper-V was with the SP1 version. Setting up the administrative workstation was a little more piece-meal for instructions, I couldn't find a nice checklist of what steps to take with the workstation (hence the instructions below). The administrative workstation took about a 1/2 hour, not counting software download times. Regardless of whether you will be administering the Hyper-V Server 2008 R2 / Windows Server 2008 R2 Core machine from an Administrative workstation or a full install of Server 2008, whatever username and password you are logged in with at the remote machine be sure to create a Local Administrator account on the Hyper-V / Core machine with indentical username and password. This may be a security risk for deployment and will probably need to be changed, but for initial setup and configuration you will save a lot of headaches with matching username and password. I had no problems administering this workgroup Hyper-V / Core machine from a Domain Controller on the same LAN logged in with a domain administrator account, just make sure the Hyper-V / Core machine has the same username and password. Note: This page is also a check-list for staff, some day I'll break out that information. Free Microsoft® Hyper-V™ Server 2008 R2 SP1 is available from the Microsoft Download Center, you may want to verify that this is the most current version. 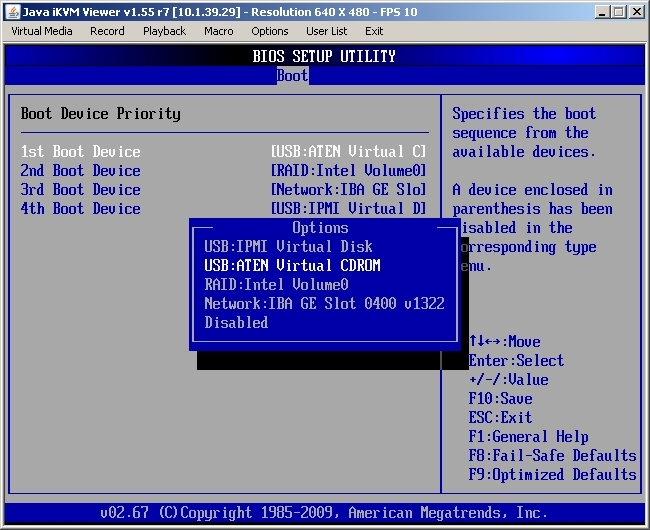 Tip: connect the IPMI NIC to the LAN, boot up the server, go into the BIOS to see what address was picked by IPMI: Advanced > IPMI Configuration > Set LAN Configuration, you will see the IP picked up by DHCP. Then you can go back to your workstation and use the SuperMicro IPMI View utility to KVM over IP control the system. 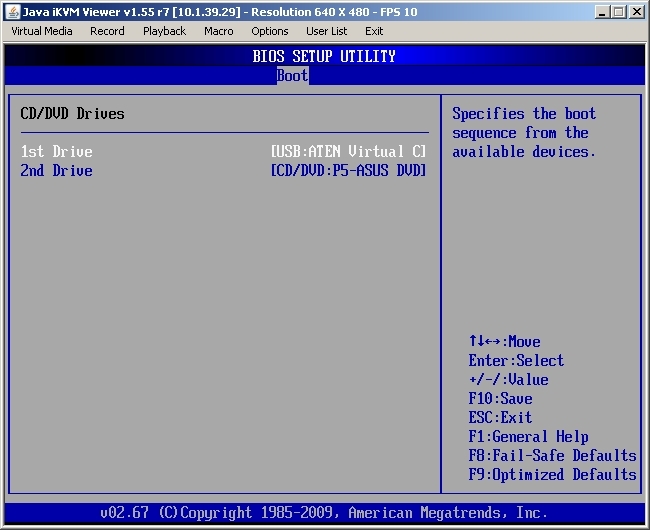 To install the Operating System from the downlaoded .ISO file, don't forget to use the "Virtual Media" option to map the installation .ISO file as a connected DVD-ROM drive. Reboot and configure the hard drives <Ctrl+I> for RAID1 (Mirror). Note: Utility version must match driver version to manage IRST! --From AW, Make directory on ServerV C:\IntelUtil and extract .zip file contents to it. --change to 64-bit drivers directory and use pnputil to install V10.0.0.1046 drivers. - Install the "Remote Server Administration Tools for Windows 7"
The default script host is now set to "cscript.exe". John Howard, Hyper-V Team, Microsoft Corporation. INFO: MMC Firewall exception changes OK.
My first run at remotely administering this new server was from a Domain Controller. That was before I found the "hvremote" utility. I believe the same instructions can be used on a 2008 R2 server (with GUI) as listed above for Workstation setup, skipping of course the first step of "Install Server Administration Tools".